And then, the page goes on, explaining how to migrate your data from TrueCrypt to BitLocker. On a first look, this doesn't seem legit because of the redirection (why not change its homepage? ), the message (if there are security issues, why not fix them or at least try to? - also, a recent security audit didn't reveal major issues though more audits were pending) and because of the alternative the page recommends: BitLocker, a proprietary full disk encryption feature included with Windows, which poses quite a few security concerns itself. The TrueCrypt SourceForge page now hosts a new version of TrueCrypt which contains warnings that the program isn't safe to use. Also, the application was changed so that it allows users to decrypt data but not to create new volumes. There are various speculations as to what actually happened with TrueCrypt, including scenarios in which the NSA had pressured the developers into doing this or that they've refused to add NSA backdoors. On the other hand, Matthew Green, a professor specializing in cryptography at Johns Hopkins University and one of the people that worked on the TrueCrypt audit, says that he thinks this is legit. 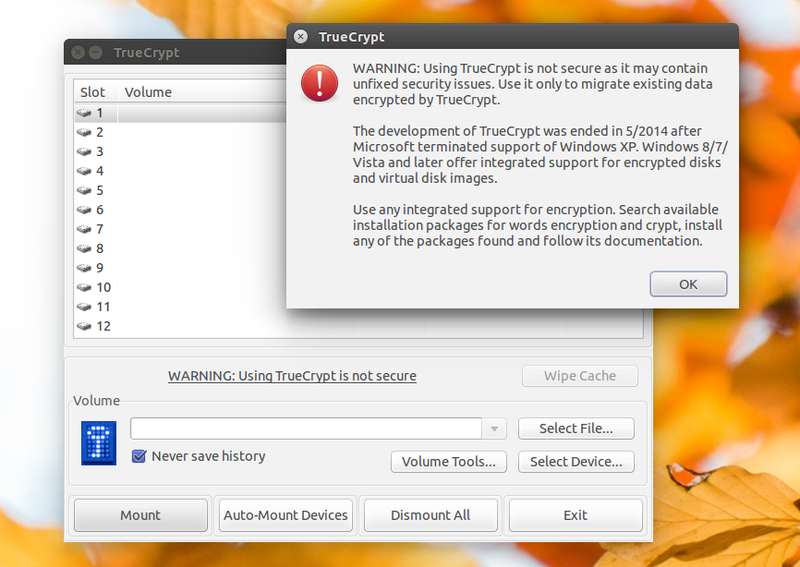 Update: TrueCrypt was forked as VeraCrypt. If you want to encrypt an USB drive with cross-platform (Linux, Windows and MacOSX) support, visit this ARTICLE.